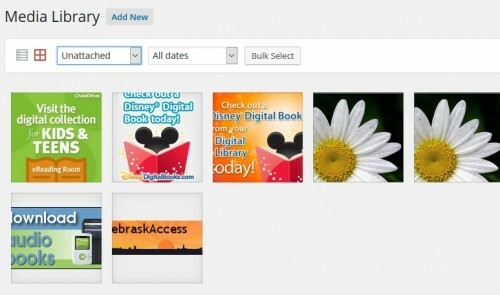 Nebraska Libraries on the Web | Currently hosting more than 100 websites for Nebraska libraries. 4. Repeat this process on all pages. 5. At the end, click through all pages on your regular website to make sure the update took effect. Please also make sure to do this at the bottom of the “Contact Us” page. Now your patrons should only have one place to submit feedback or questions. Did you know that you can store your library’s staff schedule online without making it visible to the public? This way your staff can check a direct website link from anywhere for a refresher of the weekly schedule. Create and publish a page with the schedule info. Since the page is not visible in the navigation menu, patrons don’t know the content exists and will not be able to access the page. To send your staff the direct link, paste the Permalink you copied into an email to your staff. Now you have the option to just update that page when you do scheduling. 2. What makes your library unique? 3. Do you have a mission statement? 4. How do you contribute to the community? 5. Who are the people behind the library? 1. What does your library offer to patrons? 2. What kind of materials do you circulate? 3. Do you have local collections? 4. Do you have a computer lab? Some of you may have noticed that some of the old calendars don’t support recurring events anymore. If you don’t want to manually add events one at a time, switch your calendar over to the Events Manager. In the Dashboard it will be the “Events” icon that looks like a shield. This new calendar will support recurring events and has more functionality to add widgets with event listings of calendars. Here’s some more info about using Events Manager. If you’re new to WordPress or just haven’t logged in for a while, feel free to request a one-on-one WordPress training with Amanda Sweet. They can be done over the phone so you don’t have to worry about travel. The Online Training section of the Nebraska Libraries on the Web site has also been updated with a more up to date resource selection. WordPress training is great for a refresher session or to brainstorm new and different content ideas for your website. Feel free to send a quick email if you have any questions! 2. Open the page where you want to insert the pdf. I hope everyone has a good Memorial Day weekend! Hi, everyone, I’ve had a question about RSS feed options, so I thought that I’d pass along that information via this blog post. Some of our themes automatically include “RSS feed” icons that let your visitors quickly view all of your posts or subscribe to your upcoming content. If your theme doesn’t have that feature, you still have options for adding RSS to your site. Just go to Appearance -> Widgets in your Dashboard and look for RSS Links (Jetpack). You’ll want to be cautious here, since there’s another widget just called RSS that’s a little more complicated. Once you click on RSS Links (Jetpack), you’ll be asked where you’d like to put the widget. When one of your visitors clicks on the RSS link, he or she will have the opportunity to subscribe to your content. So, instead of going to your site directly, new posts will appear directly in their browser. If you’d like to see how it looks on the user side, please click this link to view the RSS feed for all of the sites on Nebraska Libraries on the Web. As always, if you have any questions or requests for your site, please get in touch! Our network has been updated to WordPress 4.4.2. Please let me know if you experience any strange or unexpected behavior on your site. You’re (hopefully) not at 100% space used, but you might be getting closer to it if your site has lots of large images or other media files. 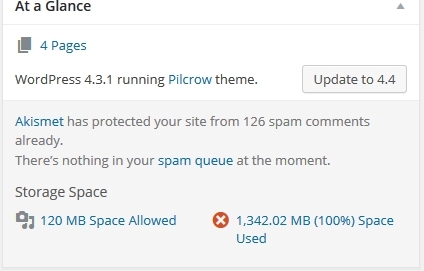 WordPress will add the red X icon to alert you that your remaining storage is getting rather low. Fortunately, there are ways to easily adjust the amount of space consumed. If you’re adding photos to your site directly from a digital camera or smartphone, you might check your settings and lower the image quality. Most devices automatically save pictures at the highest possible resolution—that’s great if you took photos of a family vacation and want every detail of Niagara Falls, but it’s usually not necessary for some of the smaller images that will appear on your website. Alternately, you can use free programs like Irfanview to reduce the size of your images before you upload them. 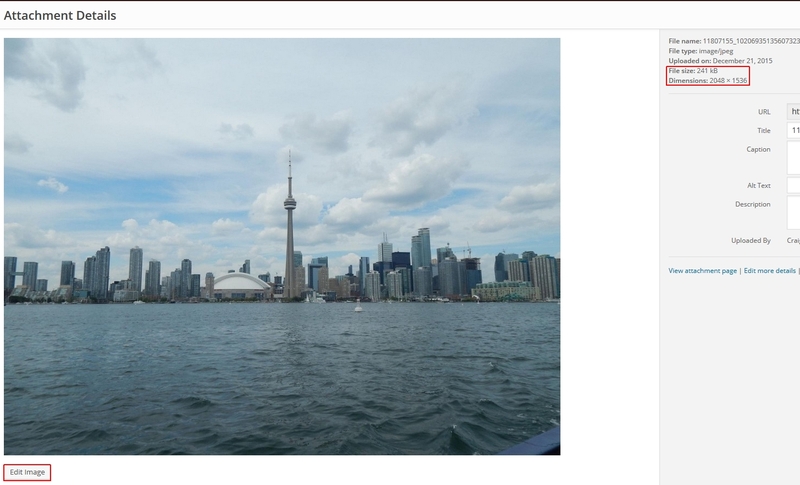 For existing images, it’s not a bad idea to check file sizes and use WordPress’s built-in image editor. Just go to Media on your Dashboard and you’ll see a list of your existing files. Clicking each one brings up details about the image. Click the image below to see a larger version of it. On the right, you’ll see File Size and Dimensions. To give you an idea about dimensions, our sample image above is 1,456 × 883 at full size. If an image seems to be too big, you can click the Edit Image button at the bottom, then use the Scale tool to shrink it down a bit. If you see a number that’s larger than around 2000 on either side, the image can definitely be scaled down without a noticeable drop in quality. Other potential problem areas are duplicate photos or older media that you’re not longer using on your site. If you’re seeing more than one instance of a particular image in your Media section, it might be a good idea to delete those duplicates and save that storage space for new photos. Similarly, if you have older photos that you’re not currently using, you might delete those from your Media library. Just be sure to save them to your computer first, if you think you might use them again someday! If you’d like any assistance regarding storage on your site (or any other issue), please don’t hesitate to get in touch!